As the Hoosiers entered halftime down 34-33, another 20 minutes defined by sloppy turnovers and not-up-to-Archie-Miller standards on defense, it seemed a real possibility Indiana could start this season 1-3. But the Hoosiers turned things around in a big way in the second half. They turned it over just three times. They recorded five blocks. The strung together some great sets on offense. The Assembly Hall faithful had plenty to cheer about and made their presence felt. It was all enough to propel the Hoosiers to a 17-point victory on Sunday night and pull this team to .500 on the young season. The cream and crimson also got some strong individual performances. Juwan Morgan played with an energy and intensity not seen in some time and his efforts showed up on both sides of the ball. The junior recorded a stat-stuffing line of 15 points, 10 rebounds, four blocks and a steal. Morgan shot just 3-of-7 from the field, but his aggressiveness on offense rewarded him with a 9-of-10 performance at the line. Seven of his 10 rebounds came on the offensive end. His four blocks were a team-high. An engaged Morgan on both ends of the floor makes this team better. And as a junior, one hopes performances like tonight can become more consistent. Robert Johnson also shined. The senior didn’t get off to the best start this season in Indiana’s opener loss to Indiana State (seven points on 2-of-8 shooting), but has ripped off three straight games of double-digit scoring performances, including a team-high 21 points tonight. Johnson came to play in both the first (12 points, 5-of-6 shooting) and second half (nine points, 4-of-8 shooting) of the contest. Johnson also was a catalyst on defense in the second half when Indiana clamped down on the Bulls and recorded two blocks of his own. Thanks to just those three miscues after the break, Indiana’s turnover percentage from halftime to the end of the game fell nearly 10 percent (29.5 percent vs. 19.7 percent). 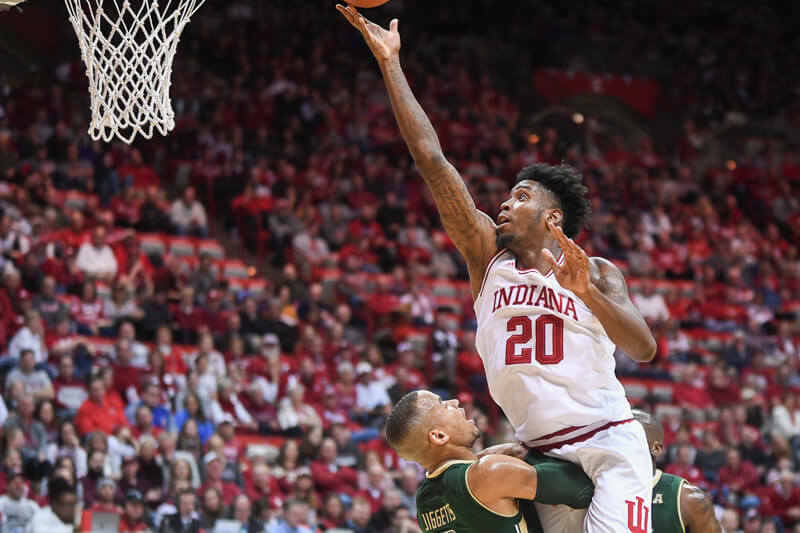 That 19.7 mark for the game was better than Indiana’s two losses against Seton Hall (26 percent) and Indiana State (26.5 percent), but it’s still a little too high for a team that lacks an elite offense. The Hoosiers held South Florida to just .87 points per possession tonight, the first time this season they’ve held an opponent under a point per possession. The Bulls scored just 19 points after halftime. This also marks the first game this season Indiana has not given up 50 points or more to an opponent in a half. De’Ron Davis got in a bit of foul trouble tonight, but still managed 25 minutes of action and continues to be an efficient post presence when given the opportunity (12 points, 5-of-7 shooting). Miller’s trust in freshman Al Durham Jr. was on display again tonight, as he logged 31 minutes. He never turned the ball over, was aggressive and got to the line (5-of-7) and posted nine points to go along with four assists and five rebounds. After a bit of a concerning start, it was a nice bounceback half for the Hoosiers. We’ll soon see if its a sign of things to come, as the Hoosiers have two more games this week on Wednesday and Friday. Nice second half of Archie basketball! Get Justin more minutes! Keep playing Clifton. If Curtis, Al, and Devonte can hit open 3’s, this team can play. Rob and Juwan were studs! DeRon needs to turn and run back on D. Those are cheap silly fouls he gets in our offensive end after the ball is lose. Haven’t seen technical from coach for a long time. I just felt that was hilarious. We have to maintain the FT shooting. I’m more convinced that this team will not have a problem with effort. It just looks like they have bought in. Looking forward to the ride at this point, wherever it leads. I hope DD was wearing his D cup in that pic. Yeah, that towel kind of got away from him. Looks like he meant to throw it into the bench (display of his passionate nature, but no technical) and it sort of glided onto the court. His reaction was classic. Al’s shot looking a little flat. He has been working on it, so we’ll see if the current “shot doctor” can help him out. It was an accident, but he owned it. LOL He actually tried to throw the towel on the bench, but it (and his scorecard) slid to the floor. I was thinking about that last night watching the game. Was last year the anomaly for Davis’ FT shooting? Is he really closer to a 50% FT shooter? His form actually looks pretty good, I don’t know what the issue is. This Al Durham kid is pretty darn good. Have to give one last hat tip to Crean for finding him. He reminds me of Stan Robinson with his defense and being a lefty. He seems to take much better care of the ball than Stan did though. I don’t know either. He certainly seems to be clunking them off the rim a lot … front or back of the rim. I’m not a shot-doctor, but isn’t that rotation? You’d think a big youngster like him would know where the cookie jar is! !